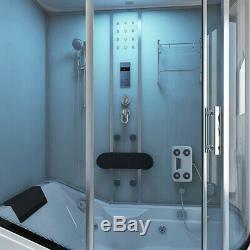 HOME DELUXE Whirlpool Steam Shower Tub Bathtub. 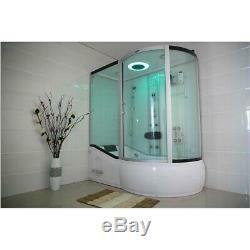 Steam shower ALLIN 4in1 white (right). Room saving allrounder in tub size! "ALL IN 4in1" delivers, what the name promises. This total SPA experience makes your heart leaps for joy. Concept of ALL IN is specifically ergonomic to guarantee all the features within such little space. It doesn´t matter whether taking a shower or taking a bath (whirlpool), ALL IN makes it possible with one push of a button. Naturally the common usage of a hand shower, which is adjustable by the fixed slide bar, is possible. Relax during a soothing bath in the whirlpool under the blue ceiling, take a break from everyday life with a tropical rainforest shower or relieve your stress taking a steam bath (optional with aroma). The ozone sterilization system ensures an ecofriendly cleaning. 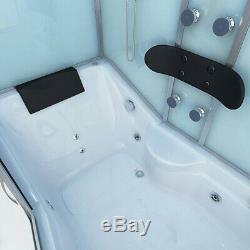 Anti-slipping bottom and a bordered seat in the tub ensure safe usage. Foot massage for a relaxing zone therapy and 8 adjustable jets, which massage your back, at the middle bracket, accomplish the perfect relaxation. Not only the features are remarkable but also the quality is very fair for the offered price. Special features of the ALL IN series are the 5 mm ESG tinted white tempered glass, the aluminium frame construction and the computer controlled touch panel. Thanks to the adjustable feet of the shower tray the product is easy to assemble almost everywhere. Is the shower cubicle in a noble black more suitable for you? No problem, the ALL IN black makes it possible! There is also a back-to-front ALL IN model and different sizes! 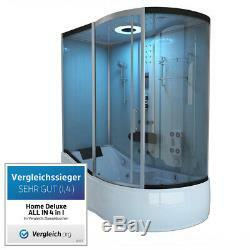 Steam sauna (smooth to 60°C) adjustable if requested (up to 3500W straight from the power point). Whirlpool runs with 4x air jets and 2x body jets/ hydro jets (run with water pressure). 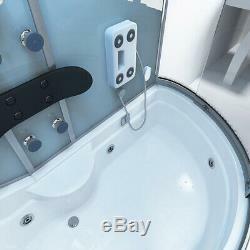 Removable foot massager works with water pressure. Shower tub made from white sanitary acrylic and with fiberglass reinforced. 12 white LEDs integrated in the middle panel. Sliding door easy to close by integrated magnetic bar quiet and tight (soft-close mechanism). Hand shower with 3 jet variants. Shampoo shelf at the front blind. Easy replacement of individual components in case of attrition. Works also with tankless water heater. Packing: in 5 boxes, safely packed and checked for completeness. 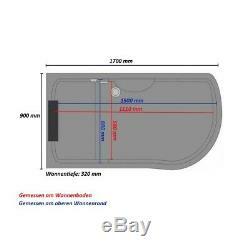 Package dimensions: box 1 170x29x15cm; box 2 174x98x75cm; box 3 167x73x5cm; box 4 150x83x4cm; box 5 170x80x15cm What you should consider with this steam shower cubicle: - Please take measurements to ensure the shower cubicle ALL IN will fit into the designated room - Tiled underground would be ideal and recommended, but not compulsory necessary - Connection to hot and cold water feet and water outlet necessary - Power connection: 2 regular power points (220-240V). 220cm necessary - Dimensions (length/width/height): 170x90x218cm - Access height: ca. 51cm - Access length: ca. 60cm - Shower height: ca. 196cm - Tub width: ca. 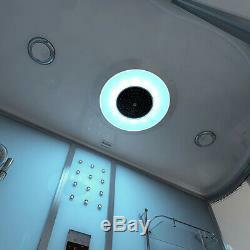 225liter - 8 back massage jets - 4x adjustable air jets (intensity) - 2x body jets for a comfortable back massage - 12 blue LEDs in the panel and tropical shower light in the ceiling are selectable separately - easy clean surface. 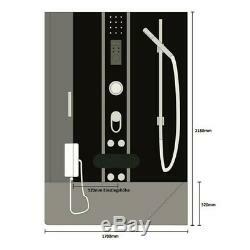 All supplies are included (except for flexible hoses) to install the shower cubicle without any problems. All other connections are flexible (water, power, drain), so our models fit to existing connections. The entire hose system is enforced max. Wature pressure of 4 bar to avoid any problems. The item "HOME DELUXE Whirlpool Steam Shower Tub Bathtub" is in sale since Monday, February 18, 2019. 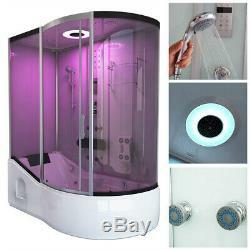 This item is in the category "Home, Furniture & DIY\Bath\Shower Enclosures\Shower Enclosures".